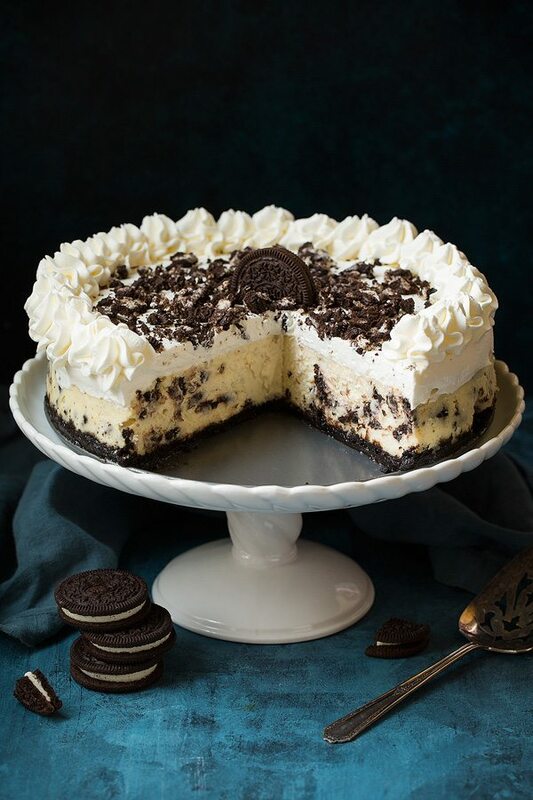 This time around I’m sharing this perfectly decadent Cookies ‘N Cream Cheesecake (or as some may call it “Oreo Cheesecake”), which comes from the ever-so-tempting Sally’s Baking Addiction Cookbook! This cheesecake is all of my cheesecake dreams come true and I know I’ll make it again and again. I’m sure soon enough people will start begging me to bring this along to parties! I’m thinking it would be perfect for the New Years Eve parties coming right up. 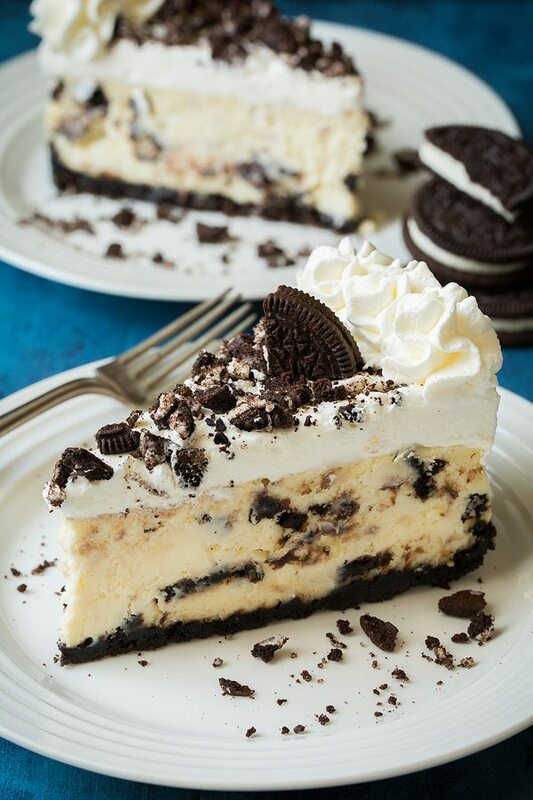 Cheesecake is always a good dessert choice, always. Recipe from Sally’s New Cookbook! I’ve been following Sally’s blog for years, practically since she first started it and I’m always amazed by everything she shares. 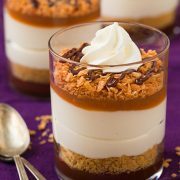 Her pictures are beautiful and her desserts always leave me wishing I could reach through the computer screen and grab what’s in front of me. 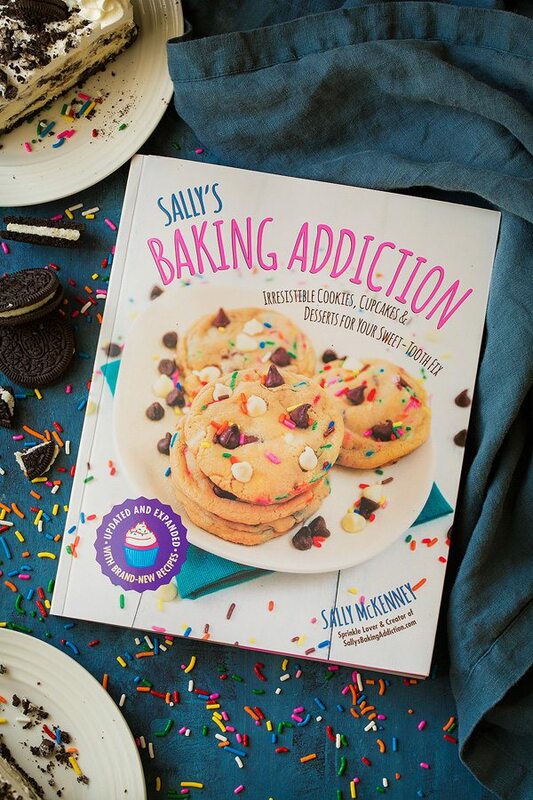 Her first cookbook – Sally’s Baking Addiction cookbook (the one pictured above) has been re-released as paperback version and updated with an additional eight brand-new cookie recipes added, so there’s never been a better time to buy a copy (she has a second cookbook which I have and love as well and a third cookbook in the works)! Sally is a baking queen, if you are ever on Pinterest you are always sure to come across several of her amazing recipes. This cookbook includes breakfast baked treats, cakes and cupcakes, bars, pies, candy and sweet snacks, and plenty of cookie recipes and each recipe is paired with a photo that will leave you wanting to try it all! It’s definitely a cookbook I highly recommend adding to your cookbook collection! 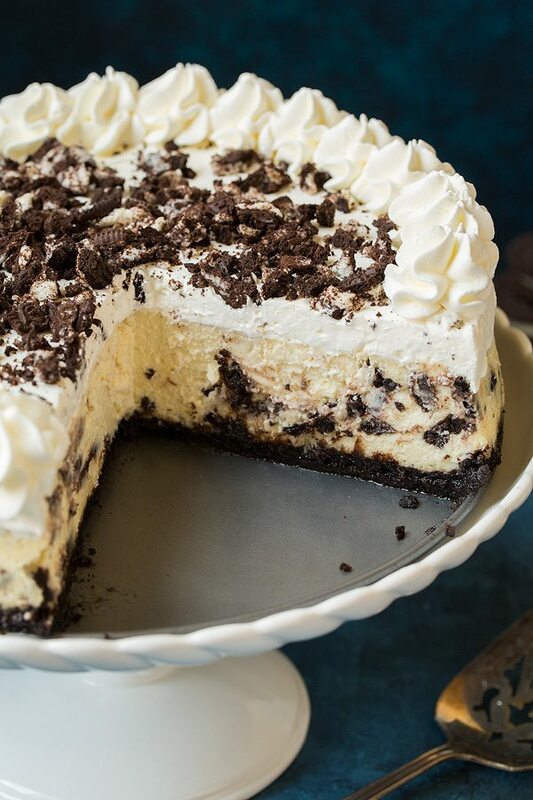 Try out this Cookies ‘N Cream Cheesecake recipe and you’ll be agreeing with me on that one. You can purchase Sally’s Baking Addiction cookbook from Amazon or Barnes and Noble. You can also check out her blog here for more info and pictures from her cookbook. In other words, this cookbook is filled with everything I love! You can’t go wrong with this cookbook or this decadent recipe from the book! Love at first bite. Preheat oven to 350. Line a springform pan with heavy duty foil (so water won’t leak in from water bath) and grease. Make the crust: Mix 20 crushed Oreos with melted butter then press into bottom of pan. Bake 9 – 10 minutes. Make the filling: mix cream cheese and sugar then blend in sour cream and vanilla, followed by eggs. 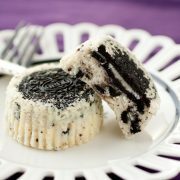 Fold in 13 crushed Oreos then pour filling over crust layer. Place in roasting pan and the pour hot water around it. Bake 50 – 60 minutes then turn off oven and let rest 1 hour. Cool to room temp, then chill 4 hours. A cheesecake that's likely to become one of your new favorite desserts! 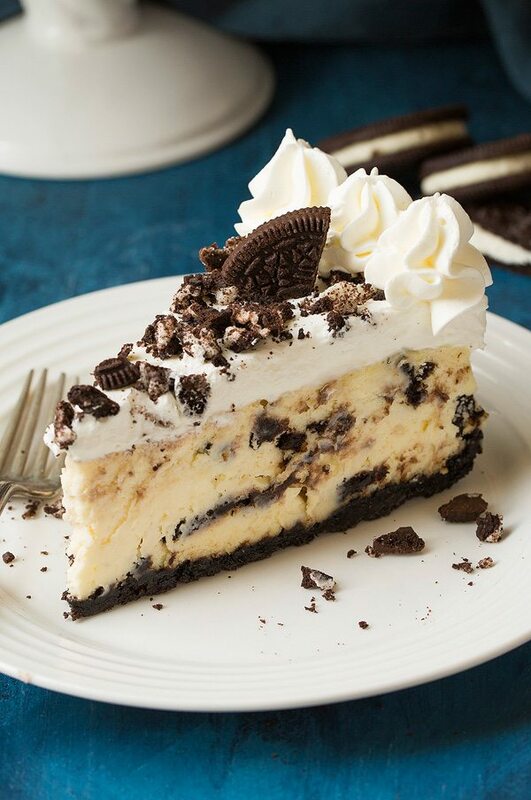 It's perfectly rich and creamy and it's brimming with plenty of chocolatey Oreo cookies. This ones a showstopper that's worthy of any celebration! For the crust: Adjust the oven rack to the lower third position and preheat oven to 350°F (175°C). Place a 9-inch springform in the center of a large sheet of heavy duty aluminum foil (about 18 by 18-inches). 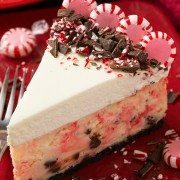 Carefully wrap foil around sides of cheesecake pan*, spray inside with non-stick spray. Press mixture into an even layer in bottom of prepared springform pan. Bake in preheated oven 9 - 10 minutes then allow to cool as you prepare the filling. For the filling: In a mixing bowl, using a hand-held electric mixer or a stand mixer fitted with a paddle attachment, beat the cream cheese and granulated sugar until smooth and creamy. Add in the sour cream or yogurt and the vanilla and mix well. Add eggs one at a time and mix on low speed just until combined. Gently fold in 13 crumbled Oreo cookies. Do not over-mix. Pour the filling into the cooled crust. Place the springform pan into a large roasting pan and place in the oven. Fill the roasting pan up with hot water until the water level comes about halfway up the outside of the cheesecake pan. Bake in preheated oven 50 - 60 minutes, or until the center is almost set. Turn the oven off and open the door slightly. Let the cheesecake rest in the oven for 1 hour. Remove from oven and allow to cool completely at room temperature. Refrigerate for at least 4 hours or overnight. Loosen the cheesecake from the rim of the pan and remove the rim. Top with whipped cream, crumble remaining 5 Oreos and sprinkle over cheesecake. Cut into slices and serve chilled. Cover the cheesecake and store in refrigerator up to 4 days. 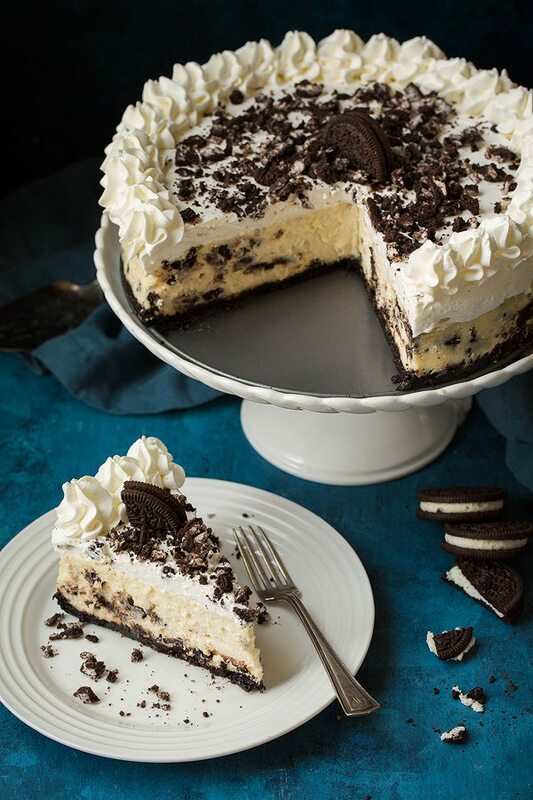 Be careful not to create any holes in the foil, the whole purpose of the foil is to prevent water from leaking in to the cheesecake so if it tears water will leak in through the separation in the bottom of the pan. Nutrition is based off of regular Oreos does not include whipped cream topping. Recipe source: recipe is excerpted from Sally's Baking Addiction cookbook by Sally McKenney. Reprinted with permission from Race Point Publishing.